or from Barnes and Noble in Nook. 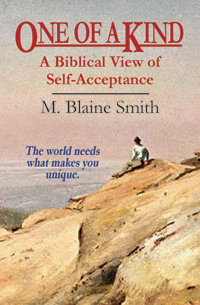 In this book on Christian self-image, Blaine Smith stresses the importance of cherishing your personal distinctiveness – as a gift of God, and a vital indication of what he wants you to do with your life. And he looks carefully at what this means. He considers how self-esteem and humility should fit together for the Christian. And he gives you solid biblical reasons to view your personality, talents and gifts, physical features, and special circumstances positively and appreciatively. His accent is on encouragement and re-inventing the way you see yourself as a child of God. “More people are likely to be blunted in their growth by poor perceptions of their individual worth than by inflated egos. Innumerable Christians have embarked on their life's calling with profound misunderstanding of their uniqueness and self-worth, thereby missing many of the delights of full-orbed Christian living. One of a Kind, first published by InterVaristy Press in 1984, is reissued by SilverCrest Books!